Papilla – Located at the very bottom of the hair follicle, the papilla is made up of connective tissue and blood vessels that nourish the hair follicle. Germinal Matrix – The germinal matrix is where stem cells divide to produce new hairs. Hair Bulb – The hair bulb surrounds the papilla and germinal matrix. The hair bulb also contains hormones that affect hair growth. The hormones signal which kind of hair to grow. 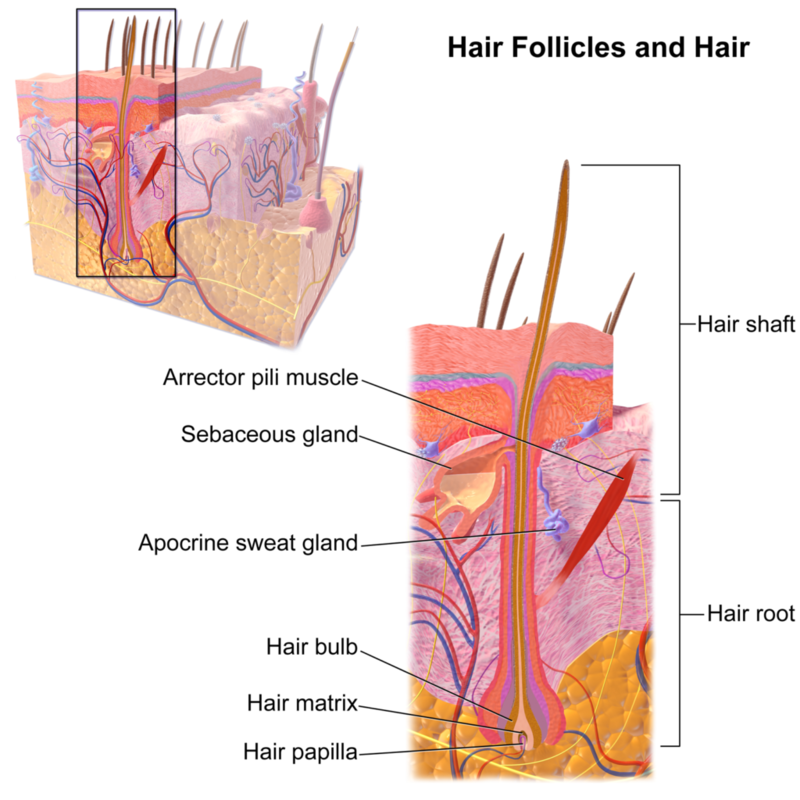 Sebaceous Gland – Each hair follicle has an associated sebaceous or oil gland. The sebaceous gland produces sebum, a natural oil that moisturizes the hair and the surrounding skin. Arrector Pili – The arrector pili is a band of tiny muscle fiber located in the center of the hair follicle. This muscle is responsible for hair “standing on end” when you get goosebumps. The anagen, or growing, phase can last between 2 and 7 years. The catagen, or transition, phase lasts around 10 days. During this phase, the hair follicle shrinks and detaches from the papilla. The telogen, or resting, phase lasts around 3 months. At this time, new hair begins growing in the hair follicle. The exogen, or shedding, phase is when the old hair shaft falls out and a new one takes its place. This short phase is sometimes considered an extension of the telogen phase. Different hair follicles are in different phases of the hair growth cycle at any given time. The variety of hair types and textures among ethnic groups is determined by several factors, such as the position of the hair bulb within the follicle and the curvature of the follicle. In addition, the size and shape of the dermal papilla is also an important factor in hair texture. Generally, the scalp follicle in Caucasian people is more elliptical, resulting in straight, wavy or more loosely curly hair. Whereas, the scalp hair follicle in people of Asian descent is circular, producing straight hair. And in people of African descent, it’s elliptical but curvy and ribbon-like, resulting in more tightly coiled curly hair. Maintaining healthy hair follicle function is critical to growing healthy, strong hair. Remember, healthy hair follicles = healthy hair. 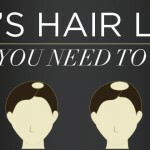 Follow these tips to keep your hair follicles in tip-top condition. 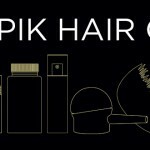 Hint: while you wait for these tips to take effect, add a few shakes or sprays of Toppik Hair Building Fibers to your scalp and hairline everyday to get instantly thicker, fuller looking hair now. Gently massaging your scalp your fingertips can help keep hair follicles functioning correctly. Massage stimulates blood flow to the follicles, helping to bring more of the nutrient-rich blood needed to grow hair regularly. In fact, in a 2016 study in Eplasty journal, researchers found that spending just four minutes massaging your scalp every day for 24 weeks can result in thicker hair. Use of a harsh shampoo or shampooing hair too often can dry out your scalp. As a result, hair follicles begin overproducing sebum to compensate for the lack of oils. The result? Hair becomes more oily than ever. Choose a gentle shampoo like Toppik Hair Building Shampoo to cleanse the hair and scalp without drying it out, while also making hair look thicker and fuller. Also, try to limit washes to two or three times per week. If your hair is too greasy between washes, a few spritzes of a dry shampoo like Batiste can absorb extra oil. Hair strands are made up of a protein called keratin. Therefore, it’s important to get enough protein in your diet. Eat plenty of chicken, lean beef, lentils and beans to maintain healthy hair follicle function. 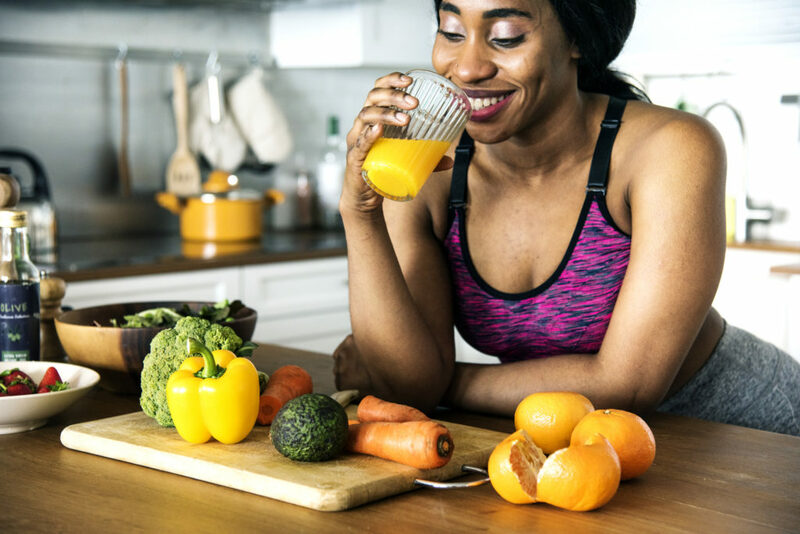 Other nutrients that benefit hair growth include zinc, iron, B vitamins and silica. 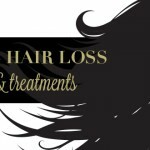 How do you maintain healthy hair follicles? Let us know in the comments! WOW! This article really useful for me. I confused for choosing the hair foods information what would be the best for everything. But review this article my confusion has cleared. 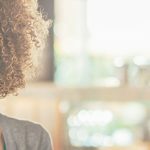 Thanks a lot for sharing such an informative article about Maintaining Healthy Hair Follicles and I’m sure most people can take notes from this article. One thing most people lack experience while aware of healthy hair. Well, this post will give me much good ideas for healthy hair care. Thanks Colleen and keep it up…….